Excellent Big Game Hunting Property For Sale. This 960 Sq. Ft. cabin built in 1985, is located on Roubideau Trail on 25 Mesa just west of Delta, CO in Montrose County. Located in GMU 62—a very desirable area for big game hunting. The property consists of 120 acres with non-motorized National Forest Access, a nice hunter’s cabin, and several small spring-fed ponds. Two gates separate the general public from access both to this property and National Forest along Monitor creek. Get the best of both worlds, private land and access to thousands of acres of National Forest. The property sits at approximately 8,300 feet in elevation and is fairly flat with aspen, ponderosa pine, sage, and oak brush. Access to the log cabin is seasonal with no winter road maintenance, but snowmobile access is allowed. Hunting on the Uncompahgre Plateau can be challenging, but rewarding. The plateau covers 2,300 square miles of terrain that consists of flat mesas bisected with deep, jagged canyons. Roads provide fairly good access to the plateau, however many of the canyons are only accessible by foot or horseback—making this property a superb base camp location. The log cabin provides an excellent place to stay warm and dry and the National Forest access off the back provides an excellent access point. The highest success rate for bulls in GMU 62 comes in the early seasons (bow hunters and muzzleloader) on the high ground, while later seasons find elk in the lower elevations and canyon bottoms. Mule deer numbers have stabilized in this Unit, with the opportunity to see mature bucks highly likely. 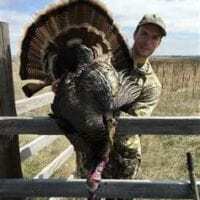 Excellent hunting in the surrounding area for bear and turkey as well. This property has excellent public land access with hiking trails, equestrian trails, biking trails, and ATV trails nearby.